Rockcliff and Kinross to Explore Laguna and Lucky Jack Gold Properties Located in Snow Lake, Manitoba — Rockcliff Metals Corp.
Toronto, ON – July 26, 2018 – Rockcliff Metals Corporation (“Rockcliff” or the “Company”) (TSX.V: RCLF) (FRANKFURT: RO0, WKN: A2H60G) is pleased to announce that it has entered into a Definitive Option Agreement (“DOA”) with KG Exploration (Canada) Inc., an affiliate of Kinross Gold Corporation (TSX:K) on the Company’s high-grade Laguna and Lucky Jack Gold Properties located in Snow Lake, Manitoba. Both gold properties are centered within the historic “Herb Lake Gold Camp”. The Laguna Gold Property, last drilled in 1944, hosts Manitoba’s first and highest-grade former gold mine and will now be the subject of the first systematic exploration program in over 100 years. The Laguna Gold Property hosts the Laguna gold mine, Manitoba’s first and highest grade former gold mine located within the Flin Flon-Snow Lake greenstone belt, a belt known originally for it high-grade gold mines then its high-grade base metals mines. Historical, intermittent gold mining at Laguna, between 1916 and 1939 produced over 60,000 ounces of gold grading approximately 19.0 g/t. The Laguna Gold Property includes 28 contiguous mining claims totalling 3,501 hectares covering a minimum 6.0 kilometres of prospective strike length of the Laguna Gold Mine Trend. The gold mineralization on the Laguna Gold Property is metallogenically controlled by subsidiary thrust faults attributed to the major regional Crowduck Bay Fault which crosses the entire length of the Laguna Gold Property. The gold-rich quartz veining and stockwork systems along the northwest limb of the Herb Lake Syncline typically occur where the subsidiary faults intersect quartz-feldspar and biotite porphyry stocks that intrude Missi Group sedimentary and volcanic rocks. Quartz, iron carbonate-albite-sericite alteration commonly overprint peak regional metamorphic assemblages within gold-bearing vein margins. Mineralization in quartz and surrounding quartz stockwork wall rock consists of pyrite, arsenopyrite, chalcopyrite, sphalerite, galena, pyrrhotite, native gold and telluride. Rockcliff’s initial reconnaissance exploration program in 2016-17 identified 7 historical surface high-grade gold-rich quartz zones with multiple areas of visible gold and surface grab sample assays from trace to over 600 g/t gold. Follow-up geophysical programs including airborne magnetics and surface Induced Polarization (IP) surveys covering the 6.0 kilometres long Laguna Gold Mine Trend that identified significant potential extensions of the known surface gold-rich quartz zones along strike below a thin veneer of overburden cover. IP anomalies associated at surface with the quartz zones extend to depths of 250 metres, the maximum penetration of the IP survey. The Company is a Canadian resource exploration company focused on exploration and generating cash flow from future royalty payments on its base and precious metal assets located in Snow Lake, Manitoba, Canada. 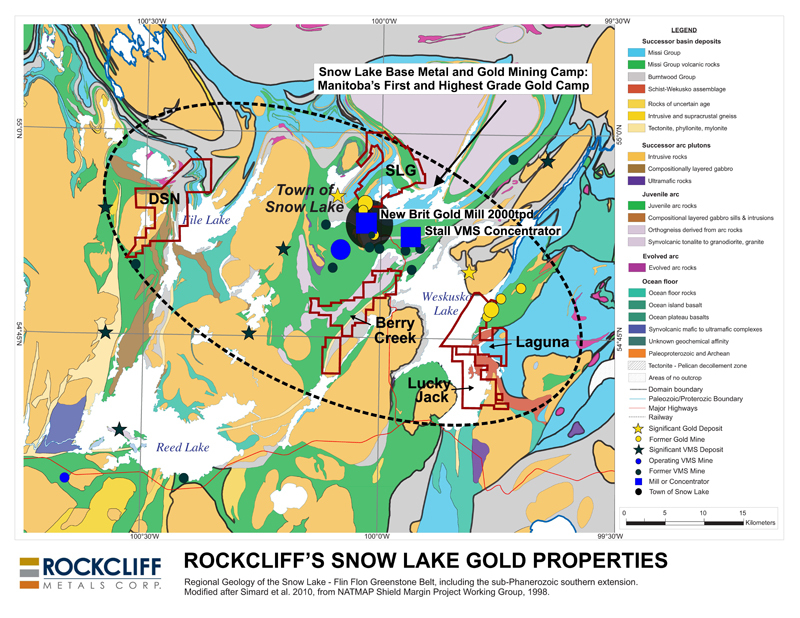 Rockcliff’s extensive portfolio of properties, totalling in excess of 50,000 hectares, is located in and around the 100-year-old Snow Lake mining camp and hosts NI 43-101 compliant resources at the gold-rich Talbot Copper deposit and the Rail Copper deposit and historical zinc and zinc-copper deposits (the Lon Zinc-Copper deposit, the Bur Zinc-Copper deposit, the Morgan Zinc deposit and the down-dip continuation of the Pen Zinc deposit). The Company’s properties also include Manitoba’s first and highest-grade former lode-gold producer (Laguna Gold Property), four additional gold-rich properties (SLG Gold Property, DSN Gold Property, Berry Creek Gold Property and Lucky Jack Gold Property), a Net Smelter Royalty on the Tower Property slated for production in 2020 (the Tower Copper deposit) and the optioned near-surface high-grade MacBride Zinc deposit located near Leaf Rapids, Manitoba. For more information, please visit http://rockcliffmetals.com/.